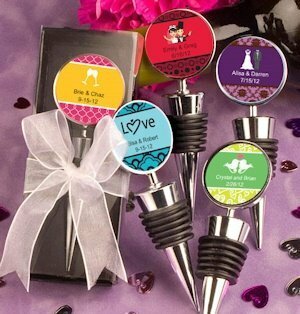 Our personalized wedding wine stopper favors make a unique and useful gift that your guests will love! From assorted color combinations to themed design, our personalized labels add an extra special touch to your favors. The 2 lines of custom text will remind your guests of your event each time they sit down to enjoy a glass of their favorite vintage. Each wine bottle stopper measures 3 3/4" x 1" and is made of chrome plated silver metal. Comes packaged in a clear topped box with a black base, finished with a white organza bow. Some assembly required to apply self-stick labels. Can you put a picture on one side of a wine stopper and words on the other side? 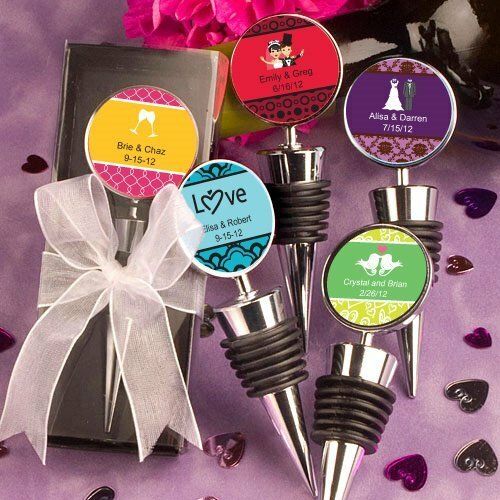 Yes, you can add a photo and upload it after adding the Personalized Wedding Wine Stopper Favors to your cart but the personalization text will be on one side only where the photo is also shown. Hi I was wondering about your personalized wine stopper. I was curious to which style you can pick for them do you have the choices? You can choose a design from our designer tool and you will have this option after adding it to your cart. You can also use the personalize now tab on the product page to see the available designs. Hi are the personalized wine stoppers just stickers that I will have to put on myself? Yes, you will receive a sheet of stickers and you need to manually attach it to the wine stoppers.